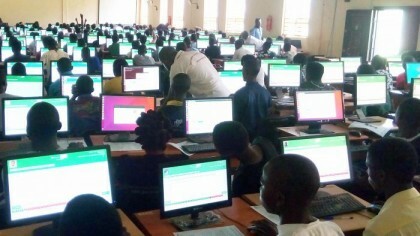 Some candidates of the 2018 Unified Tertiary Matriculation Examinations ( UTME) have reacted to the results released by the Joint Admission Matriculation Board (JAMB) on Tuesday. The candidates spoke in separate interviews with the News Agency of Nigeria (NAN) on Wednesday in Abuja. NAN recalls that the board initially released the first batch of results in the first week of the examination and over 1.5 million was later released, on Tuesday, March 20. While many had been able to check their results, others complained that their results were yet to be displayed or they were still finding it difficult to check their results. Chibuke Okafor, a candidate, described the entire process the results had to undergo as fair. According to him, unlike the previous exercise, the wait for the 2018 Examination results had a lot of mixed feelings associated with it. “I scored 249 and am happy with the result since it is above the cut off mark. “At a point, one was not sure what to expect again because it was taking longer than usual before the results were released. “Especially, when I realised that some people that wrote after me were able to get their results before I did. “Before now, every time I checked, it was either saying I did not sit for the exam or that my result was not ready, until I could finally access it last night. “ I think the exam was fair; while a lot of us had high scores, few of my friends scored quite low points,” he said. Another candidate, Lucy Ibrahim, told NAN that she scored quite high but a little less than her previous score. Ibrahim, who sat for the examination a second time because she couldn’t get admissions in 2017, said that her 2018 score was satisfactorily. She described the examination as tough, however, noted that it was nothing, compared to the tension of waiting patiently for the results to come out, almost a week later. According to her, she and her younger sister sat for the examinations a day in between but her sister’s result was yet to be displayed on the JAMB portal. Adigun, who lauded JAMB’s efforts to ensure fairness in the entire process, however, urged the board to work speedily on the results of other awaiting candidates while also praying for successful admission process. Meanwhile, some parents had complained of the challenge in accessing the JAMB portal to check results. Mr Shemang Aboi, a civil servant, said that he had in the past week, continuously been checking for the result of his son but could not access the board’s portal. “I do not know if it is network problem from my ends or that too many people are trying to access it at the same time; maybe because it was not ready then, because each time I try, it gives me different information. “Now that it is confirmed that they had successfully released the results, I will try again and hope to be successful,” Aboi said. Similarly, Mr Moses Ibanga told NAN that it took him almost an hour before he could finally access the results of his daughter from the JAMB site. He commended the board for its efforts towards ensuring a smooth and successful examination process but urged the board to do more sensitisation to the grassroots in order to give people more awareness on its system. NAN reports that 1, 662, 762 candidates registered for the 2018 UTME and 1,502,978 results had so far been released while 112,331 others were still undergoing screening.